Team Tap required for more than 2 players. Pro Controller. The Jaguar version of NBA Jam Tournament is the most arcade-faithful yet. You will need major hoop skills to compete against the NBA's finest. Your favorite players, including Rodman, Ewing and Hill are all in the game. 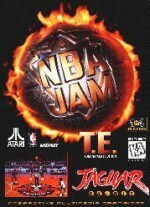 From dazzling over-the-top dunks to at-the-buzzer three-pointers, NBA JAm brings all the intensity of the hit arcade game to your TV.